Thank you all for participating at our 3rd THATCamp Boise State. A special thanks to our keynotes: Dr. William A. Nericcio, JP Chastain, and Eric Gilbert. Also a huge thanks to Woody Sobey and the staff at The Discovery Center of Idaho for letting us use their space for THATCamp. If you didn’t get to fully enjoy the Leonardo da Vinci exhibit during THATCamp then treat yourself to his genius soon, as the exhibit ends mid-November. We think these points nicely encompass what THATCamps are all about. We take care of the food and space, you bring your enthusiasm for learning and sharing with like-minded individuals–those who have a deep interest in the Humanities and tech. But, seriously: dress comfortably and have fun! A discussion (and hopefully PowerPoint presentation) about how a local comic book publisher, Idaho Comics Group, was able to secure the license for Tarzan to publish an anthology featuring writers and artists from the state of Idaho. The title of the comic book anthology is Tarzan and the Comics of Idaho #1. Dennis P. Eichhorn (Real Stuff, Real Good Stuff, Extra Good Stuff) Keynote speaker at last year’s THATCamp Boise State 2013! How much does it cost to attend THATCamp Boise State? THATCamps are usually free or low-cost ‘unconferences’ that provide a space for those who are interested in the Humanities and technology to discuss, collaborate, work on problems, and learn. THATCamp Boise State is free–all the food & snacks, the conference rooms, drinks, campus parking, etc. have all been taken care of thanks to the generous support of several Boise State University departments and colleges, and the Discovery Center of Idaho. 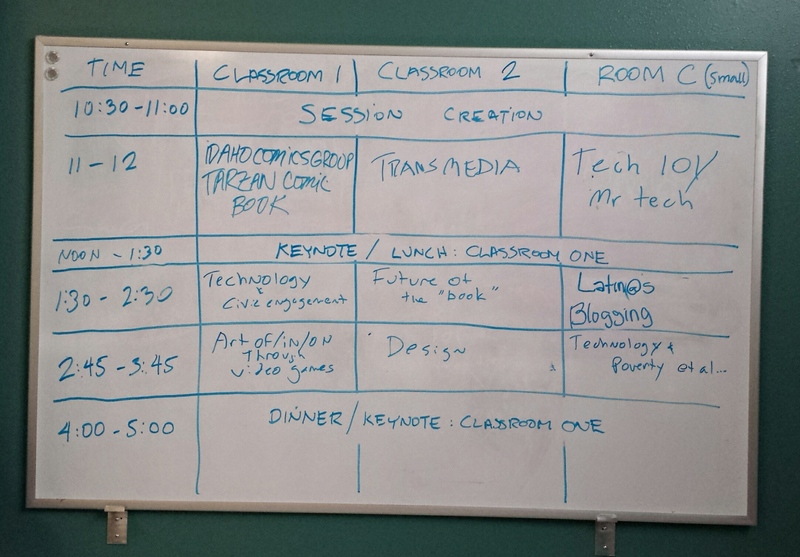 How is THATCamp different than a regular ‘conference’? In a THATCamp everyone participates! The sessions/workshops are all created the day of the event, on the spot, and everyone is expected to participate. If you have an idea, want to teach or share something, then by all means suggest it. As long as it has to do with the Humanities and Technology, we’d love to hear about it. We’ll have a signup board where you can sign up to create/teach/show something; if enough people are interested in your idea then you are doing it! We don’t want people who want to sell something or drum up business for a company. We want people who want to share for the betterment of all. THATCamp Boise State will take place at The Discovery Center of Idaho, and there’s plenty of parking available. Yes! Drinks & delicious food & snacks will be available. We’ll start with a light breakfast of cereal, yogurt, bananas, coffee, decaf, and hot tea. How long does this unconference last? Who put this THATCamp together? These Boise State folks: Memo Cordova, Albertsons Library librarian, and Francisco Salinas, Director of Student Diversity and Inclusion. 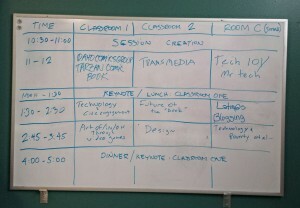 This has been a labor of love and the third THATCamp Boise State. Many thanks to the Discovery Center of Idaho for hosting us, our first out-of-campus event! Where can I can get more information? This will be our third THATCamp Boise State and we’re excited by the opportunity to provide a venue for coders, hackers, artists, teachers, and other community members to come together and get creative! The Humanities and Technology (THAT) Camp is a grass-roots unconference where the agenda is created by the participants the day of the conference. You can read more about the THATCamp experience here. Your humble chairs for this year’s camp are Francisco Salinas, Director of Student Diversity and Inclusion, and Memo Cordova, associate professor/librarian at Albertsons Library, both from Boise State University. We’re thankful for the generous support of the university’s Arts and Humanities Institute and the College of Arts & Sciences. A big THANK YOU goes to the awesome folks at the Discovery Center of Idaho for hosting this event on Saturday, September 13th. We’d like to encourage everyone in Boise (and beyond!) to attend this small unconference to celebrate, create, and address issues important to the humanities and technology. Check out our previous two camps from 2012 and 2013 to get a flavor of each event. Each camp one had its own vibe and energy and both were a blast. We’re hoping to make 2014 an even bigger success–register and make it so! First, the registration page is now open! Like our previous two camps, this one will be FREE and open to students, scholars, historians, coders, teachers, etc.–but your participation, registration, and engagement are required. There will be plenty of food and great discussions so register soon, as these small gatherings fill up fast. Second, we’re excited to announce our keynote speakers: Boise’s own Eric Gilbert [@treefortfest], and San Diego State University professor and author, Dr. William A. Nericcio [@eyegiene]. Get to know these two creatives at the Keynote Speakers page. THATCamp Boise State will take place at the Discovery Center of Idaho (DCI) on September 13th, 2014. Parking is free, and additional parking is available at Julia Davis Park, next to DCI. And lest you forget, the amazing Leonardo da Vinci exhibit will be on display during THATCamp too. ff0000;">UPDATE: We have added an additional speaker to our awesome roster: JP Chastain! Find more about JP and our other speakers here. Another THATCamp Boise State? You bet! We’re planning another THATCamp Boise State! All we can tell you right now is the date: September 13th, 2014, and the location: we’re partnering with the awesome folks at the Discovery Center of Idaho (DCI). Even more exciting is that our third annual THATCamp will take place during the current Leonardo da Vinci exhibit at DCI! If this doesn’t start your creative juices flowing better check your pulse. We will have more details soon, including our keynote speakers, registration, parking information, and the like. If you have any questions, please let us know at thatcampbsu[at]gmail.com, or connect with us via Twitter at @THATCampbsu .